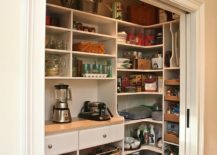 We often get lost in the rush of life and pay just about enough attention towards the big things in life, ignoring the minor details in the process. 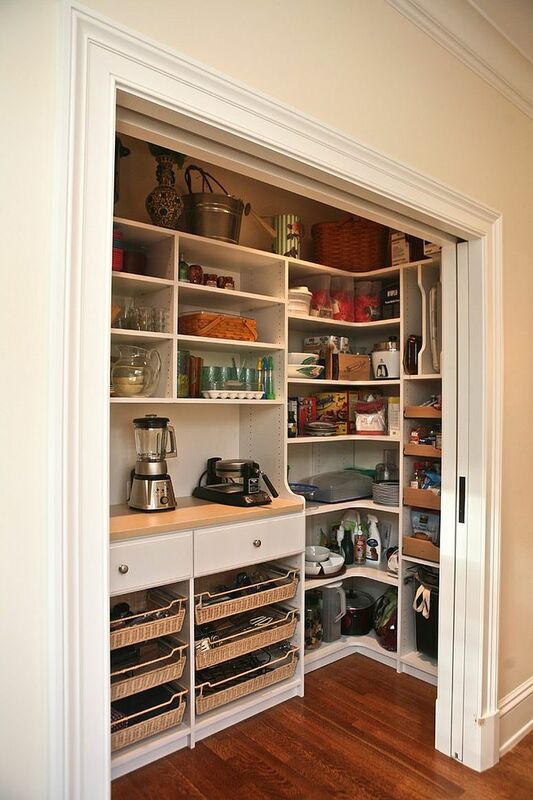 The same is true when it comes to the kitchen pantry. 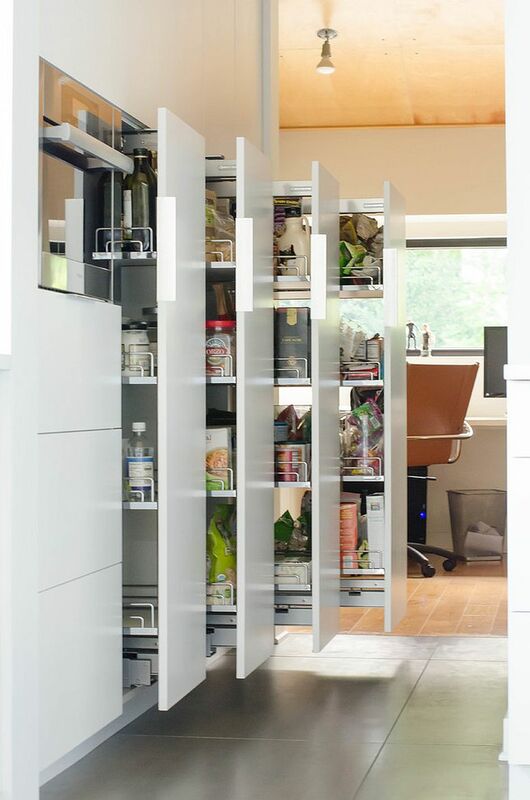 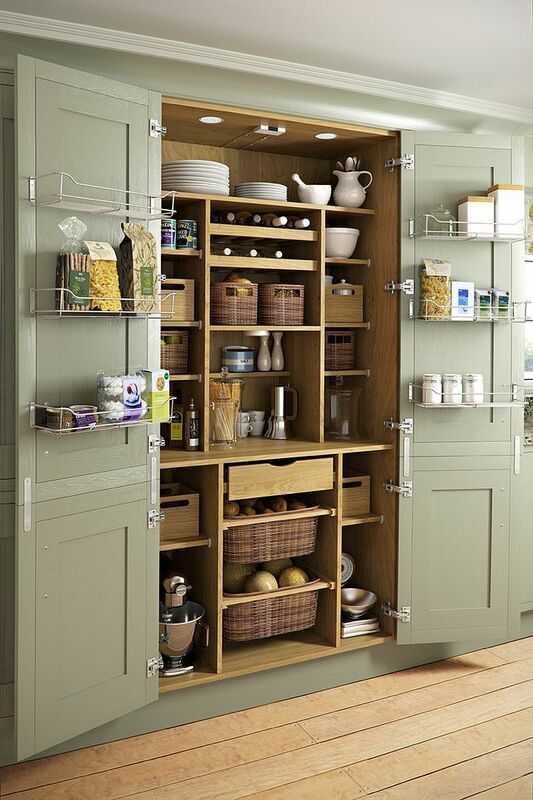 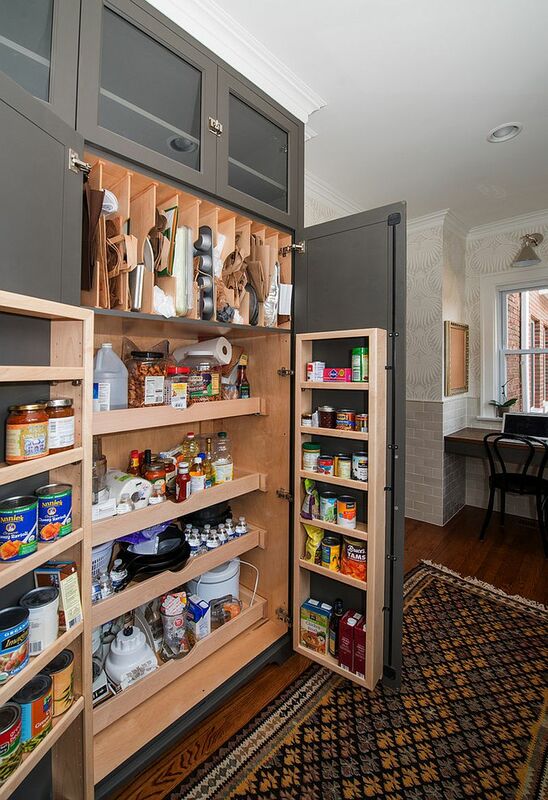 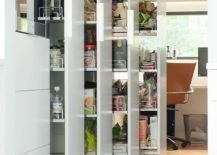 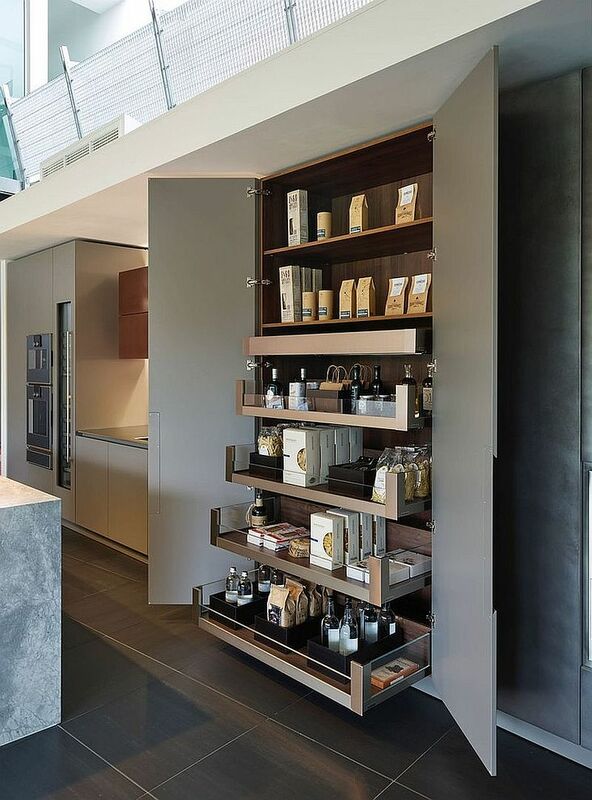 Yes, the functionality and shelving space of the pantry is a priority that cannot be ignored. 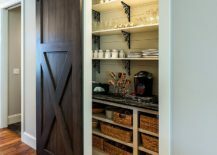 But take time this fall to venture beyond the obvious and add that something extra to the kitchen with a distinct and stylish pantry door. 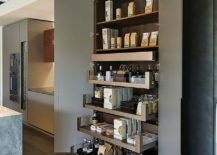 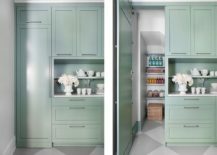 Even though it might seem like a minor detail, a smart pantry door can make huge difference to the overall appeal of the kitchen, or the area around it in general. 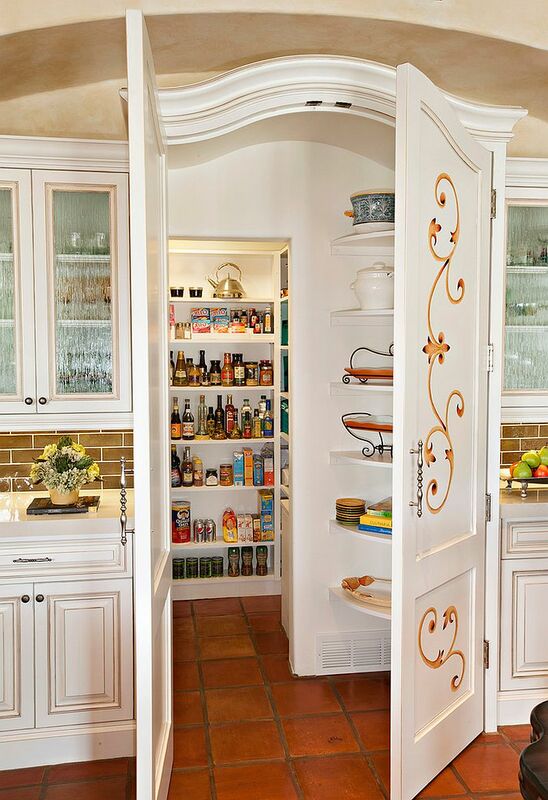 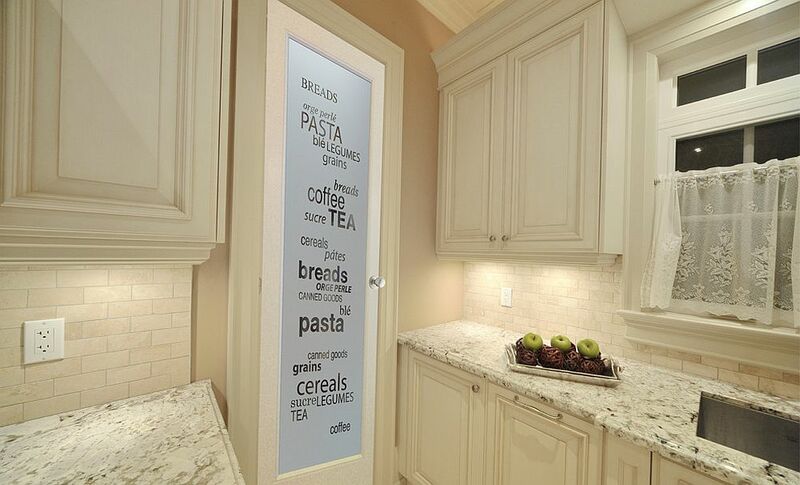 And we have the best ideas lined up today, so that you can take your pick when it comes to the pantry door. 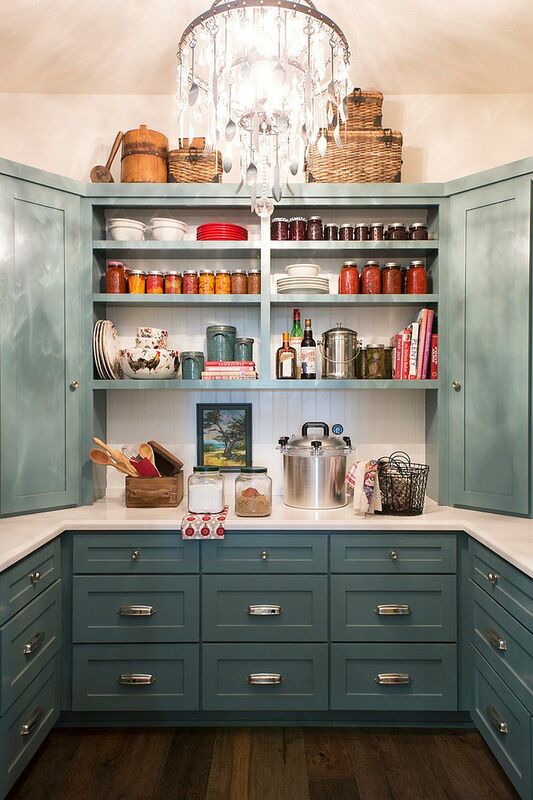 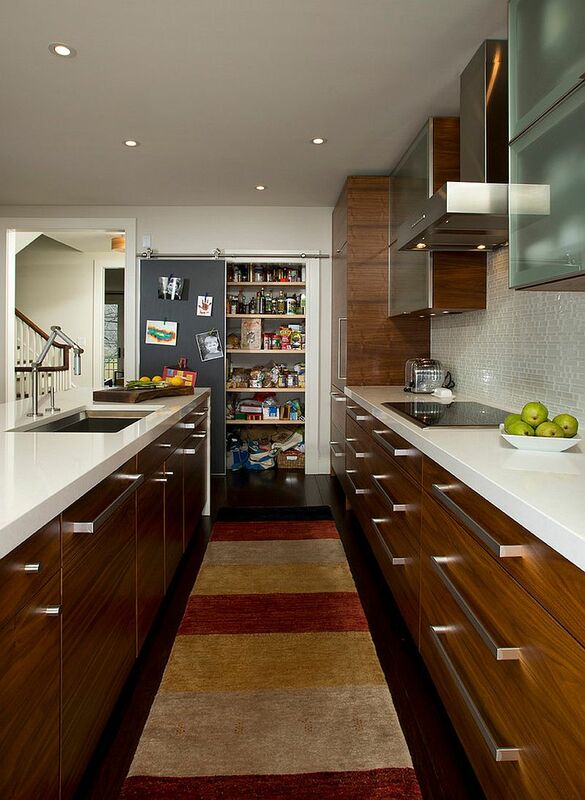 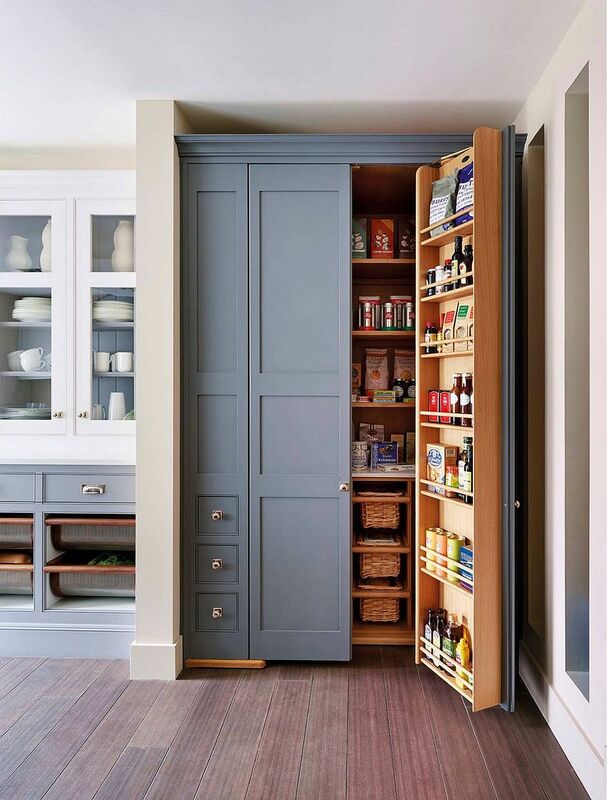 The modern pantry door is often sterile, bringing little in terms of both style and color. 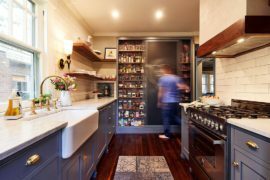 Changing it might feel like a minor makeover, but it can considerable change the overall ambiance of the kitchen. 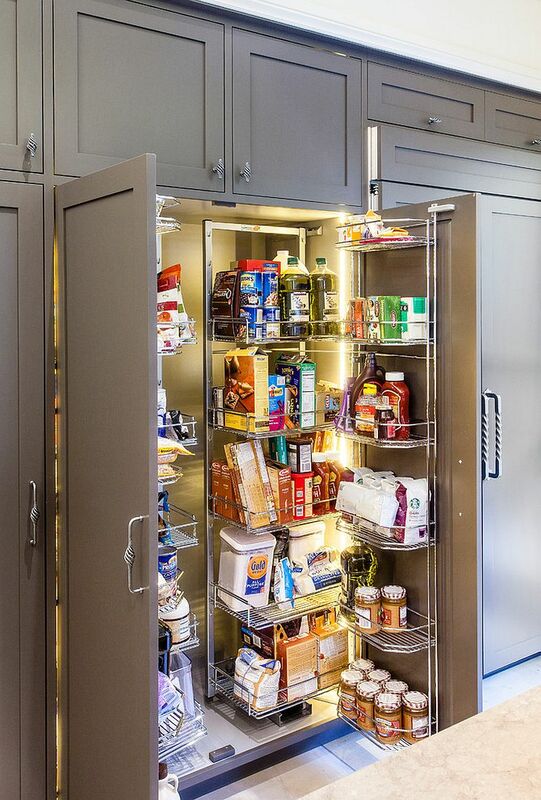 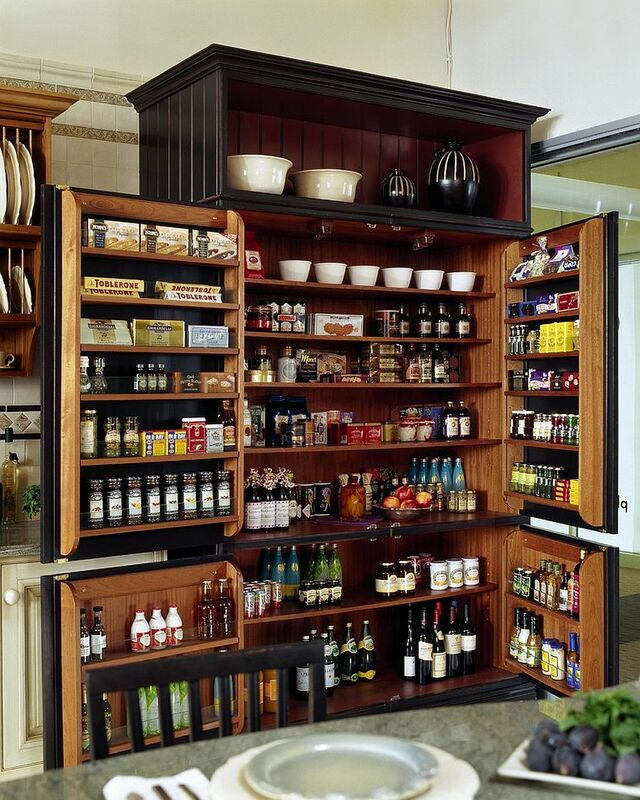 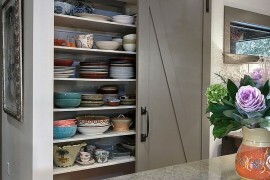 A smarter pantry door also allows you to save space while providing additional storage options. 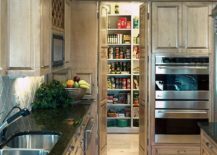 All that and a whole lot more await as we browse through 25 fabulous pantries and take notice of the doors the use to elevate both style and space! We start off with the most modern of pantry doors around these obviously come with a polished, contemporary sheen. 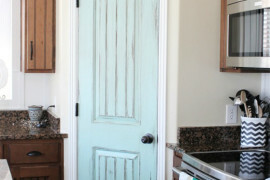 Few colors are more popular than gray and shades of blue for the contemporary pantry door. 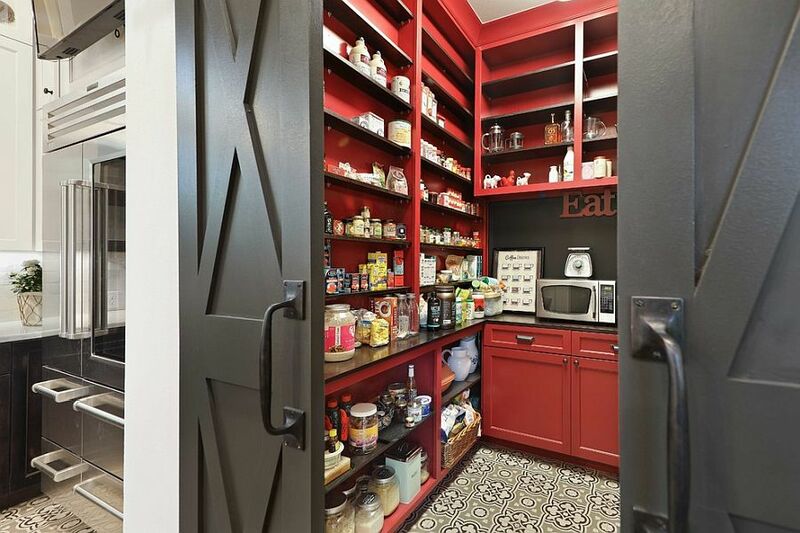 Thos who want to create more visual contrast can opt for the dashing black pantry door that stands out in the white kitchen. 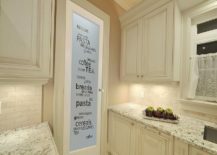 Another cool idea is the frosted glass door for the pantry that brings in natural light even while carefully hiding clutter to a large extent. 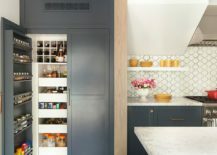 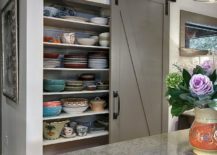 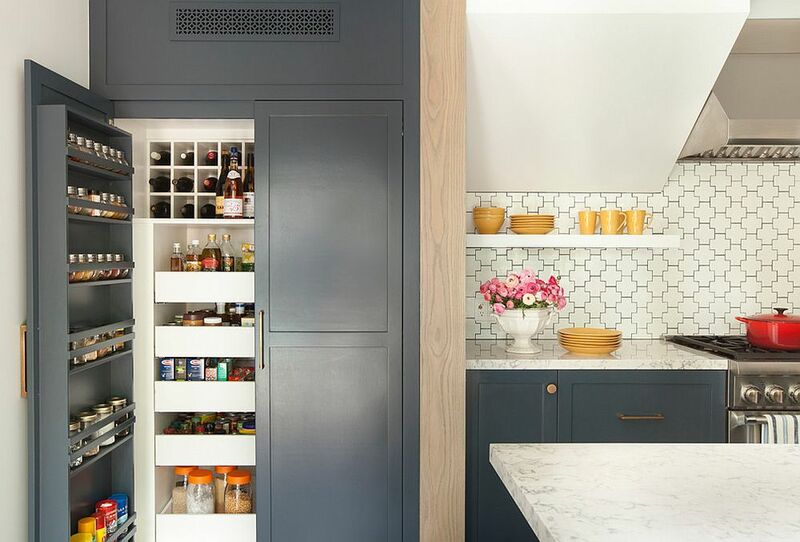 Those who are bored with the traditional pantry can turn to custom contemporary pull-out drawers that combine to create a hidden, spacious pantry. 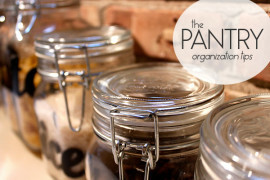 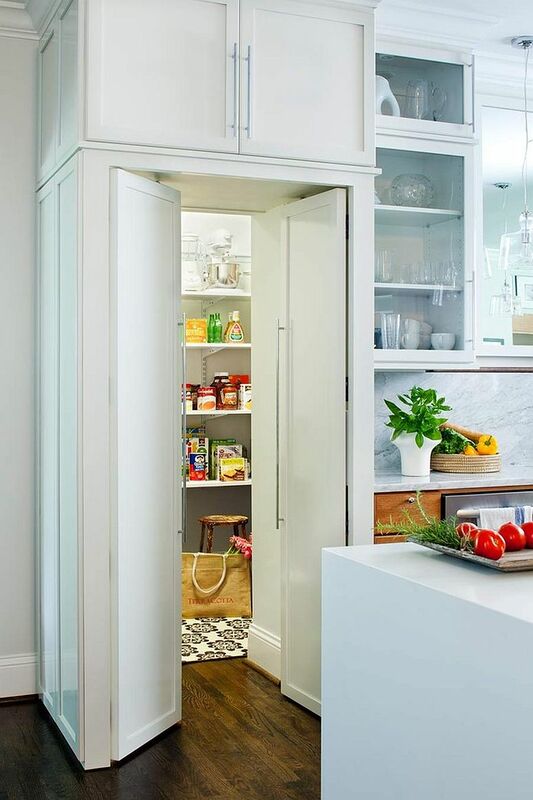 The pantry door does much more than hide everything inside the pantry. 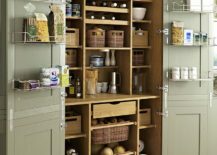 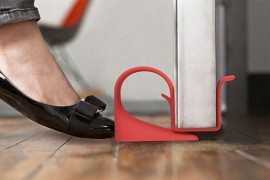 It can also provide additional storage and shelving space with built-in shelves and hanging, wiry cabinets and other smart holders. 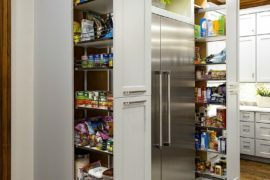 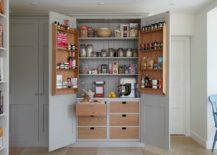 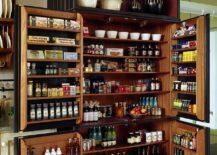 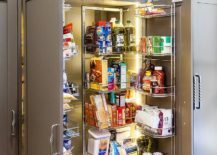 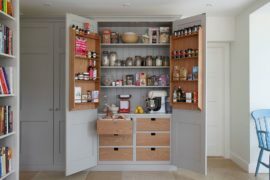 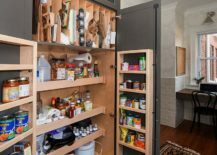 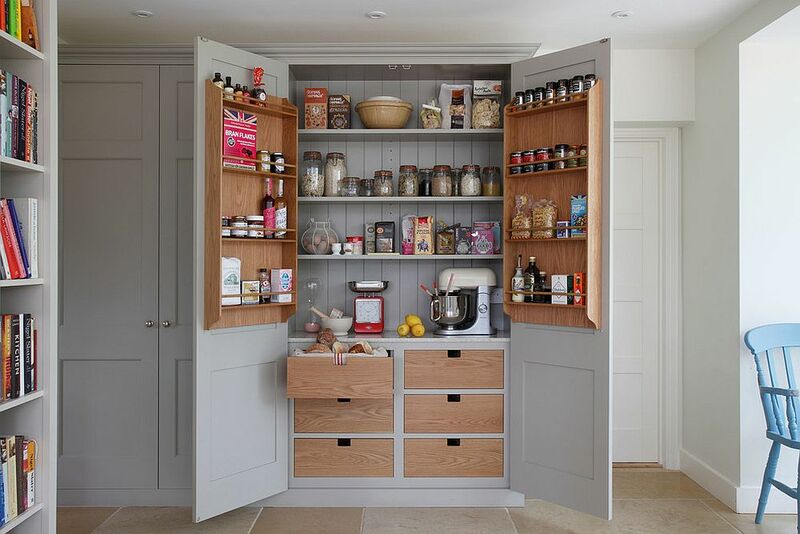 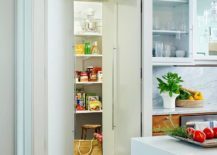 In the tiny pantry, this can come in mighty handy and those who wish to further save space can replace the traditional doors with sliding or folding doors. 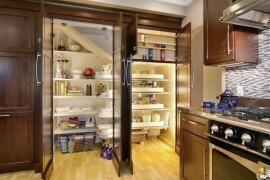 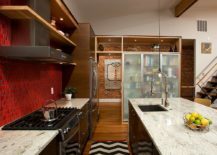 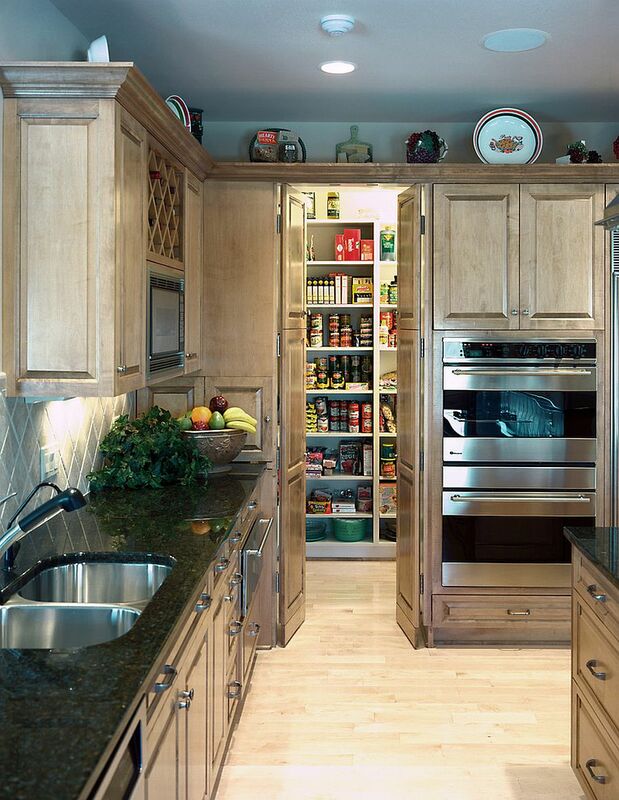 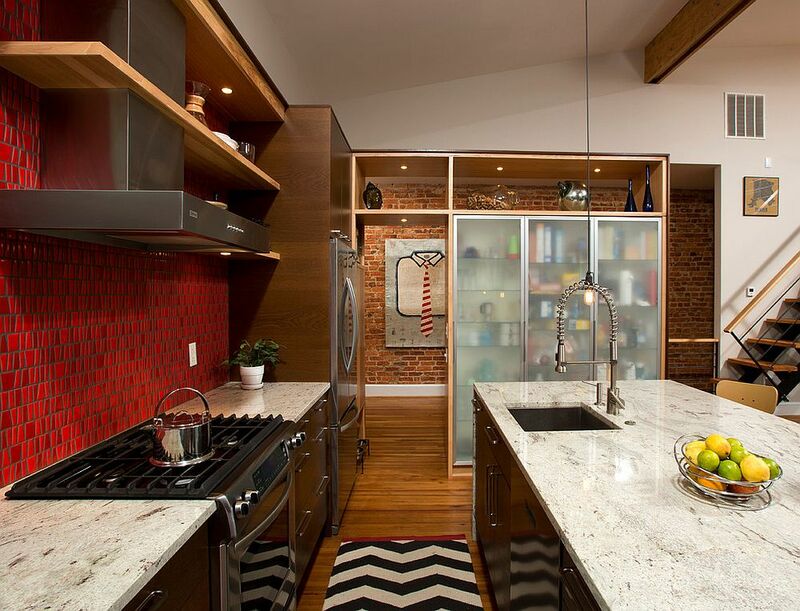 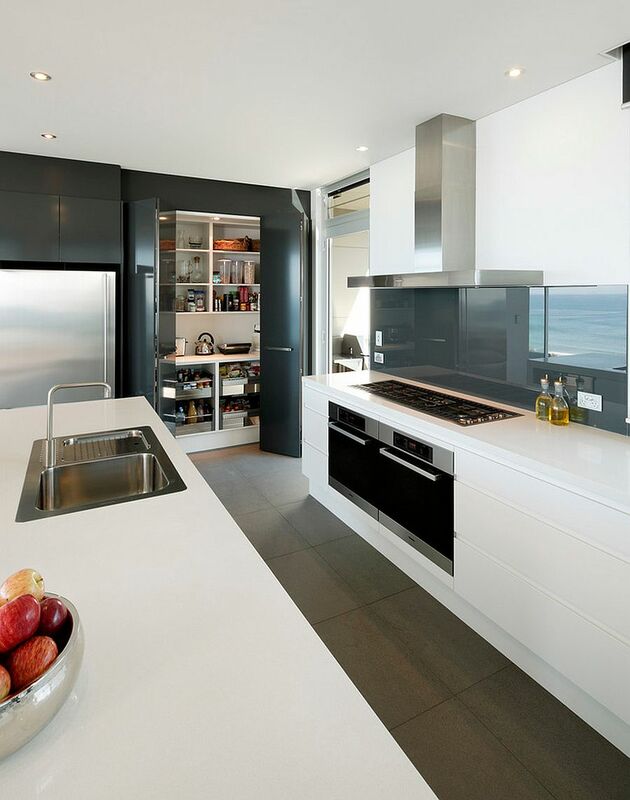 You will be surprised at how much square footage can be saved in the kitchen with a simple change of the pantry door. 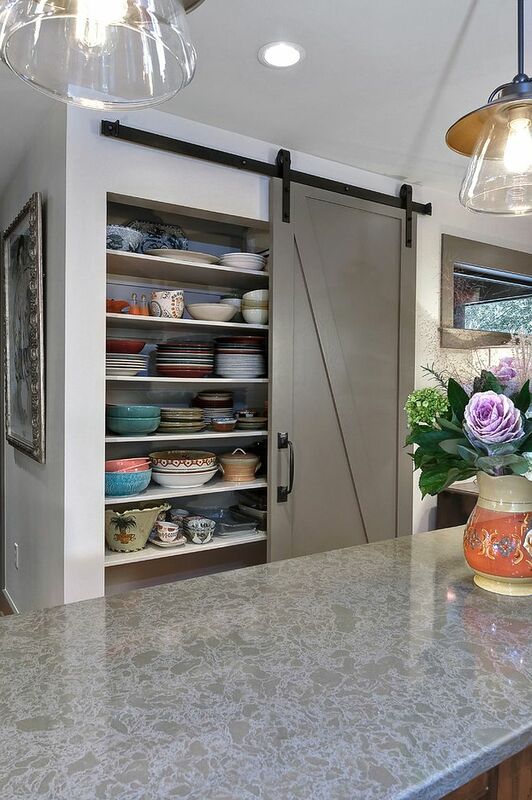 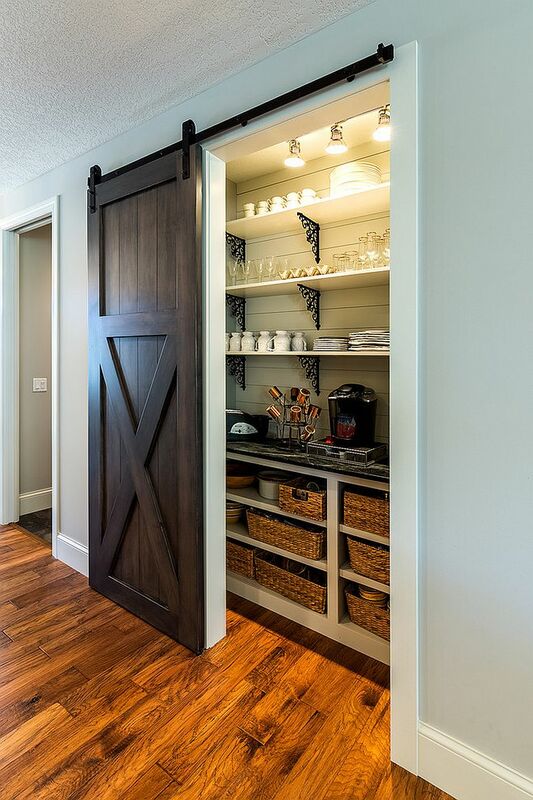 When it comes to the space-saving pantry door, few are more popular than the barn-style sliding door that is both sturdy and trendy. 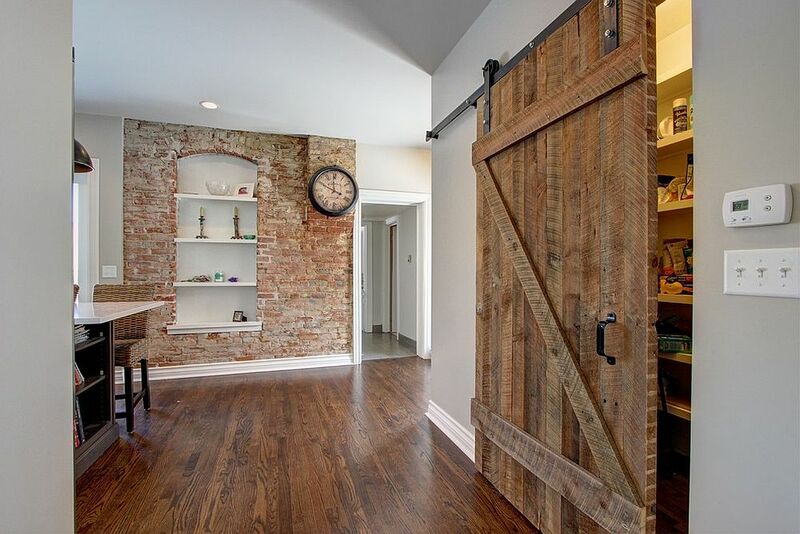 If you are not comfortable with the idea of the heavy barn door in wood, then opt for its modern fashion that employs the same ergonomics but offers different aesthetics. 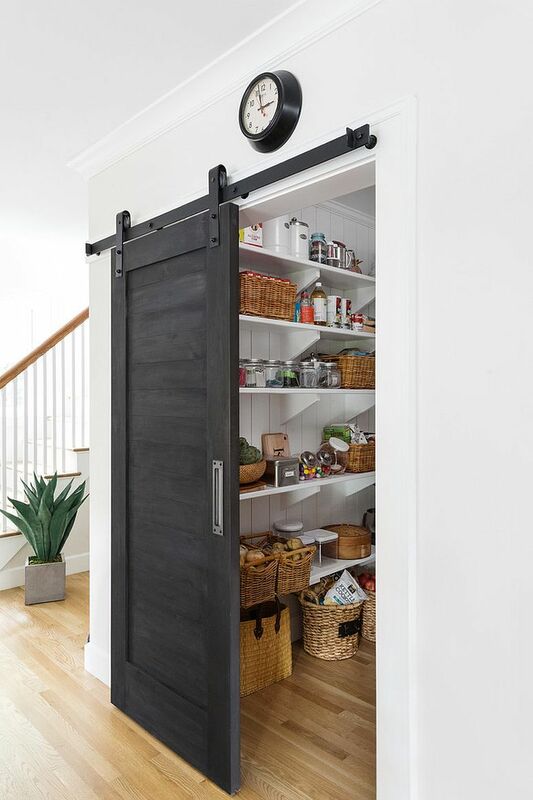 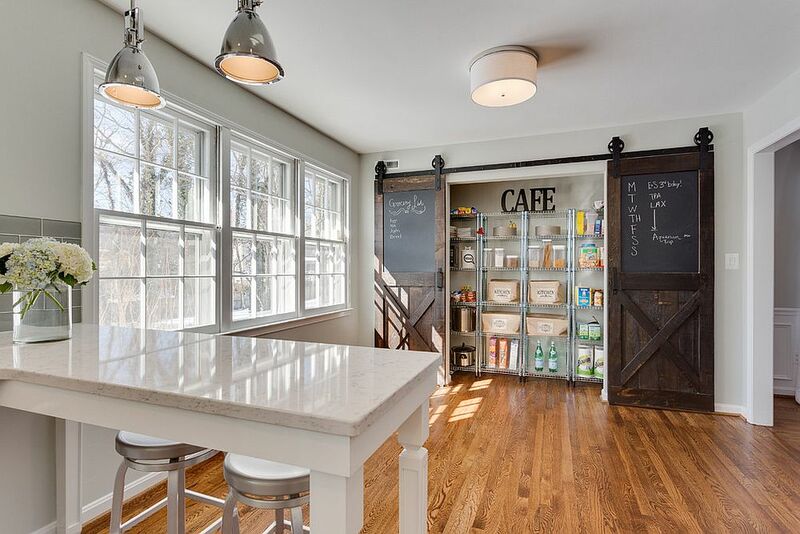 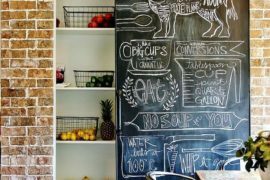 Doors with chalkboard finish or ones in metal with rustic and farmhouse overtones, even the classics work beautifully when it comes to the pantry door in the modern kitchen.